As the plane began its descent, I stole a side glance through the window. We were not welcomed by California’s famous sunny disposition, but despite the abnormally overcast sky, the Golden State did not disappoint. Several members of the Revive Our Hearts team just returned from two fruitful weeks of ministry in California. This was our first time as a ministry to make it that far west, and we were as excited to meet the women in California as they were to have us. Nancy and our team loved connecting with many of our Monthly Partners as well as introducing the ministry to new friends through church conferences and guest radio interviews. But this trip wasn’t just about making new friends; it was the fruition of years of earnest prayers from both Ministry Partners and staff members who long ago saw the need for revival in their home state and haven’t given up praying for it. California is often stereotyped as progressive in fashion, politics, and religion, yet among the millions of unchurched people in California we discovered a field ripe for harvest, individuals created in God’s image and in desperate need of Jesus—just like the Midwestern farmer or Ivy League lawyer. Among these image-bearers is a remnant of Jesus-followers who boldly and prayerfully claim California for Christ, and we were privileged to meet some of them. Our first stop, Southern California, is home to Hollywood celebrities, dramatic coastlines, and a church on a hill called Harvest Christian Fellowship. Here and later at Venture Christian Church in the Bay Area we were welcomed by women who love God’s Word and are passionate about helping older and younger women grow in Christ. Every day brought fresh encounters with these precious women of all ages, ethnicities, and backgrounds—women with beaming smiles and women with tear-stained cheeks. Women working in the marketplace and women working in their homes. Single women and married women, older and younger, each with their own story of deep pain and great joy. They are ordinary women with faith to rival the majestic mountains which stretch across much of their state. Women like the young mom who experienced unspeakable loss last year when her 16-month-old was hit by a car and killed, and yet she remains joyful and secure in Christ’s love. Or the single mother who raised her children alone and now looks for opportunities to continue investing in others, often using what she’s gleaned over the years from Revive Our Hearts. Or the twenty-year listener of Revive Our Hearts who has taught school for years in classrooms from Northern California to Eastern Europe, leaving a mark on the next generation despite never being a wife or mother herself. Or the new bride who enthusiastically embraced the message of Adorned and her calling to grow into a godly older woman—realizing it means starting now with every decision she makes as a young woman. Or the group of Millennial women who just spent two and a half years reading through the entire Bible, with older women mentors leading the younger ones in small group study. Or the prayer warriors who have met every Monday night since last October, asking the Spirit to use Nancy’s conference messages on Titus 2 to change hearts, lives, and entire communities. 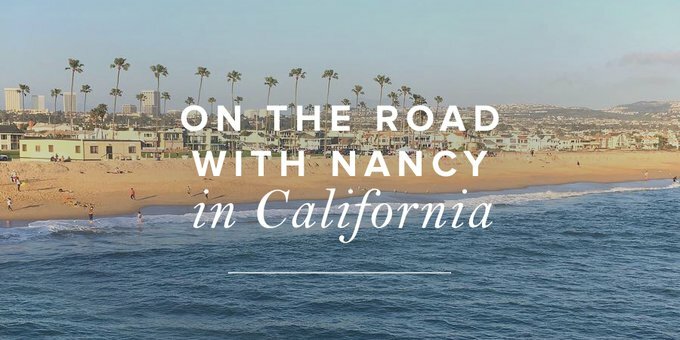 When our team made plans over a year ago for Nancy to speak at these two church conferences, we couldn’t have known God would open the door for us to partner with a radio station in Orange County only weeks before our arrival. He has clearly been paving the way for the people of California to hear more of His Word. Eager as we were upon our arrival, we left with an even greater sense of anticipation of all that God will yet do in this fertile place. California recently experienced unusual amounts of rain, bringing them out of a ten-year-long drought. We were told during our visit that the landscape was more green and lush than usual. What if God chose to similarly meet their need for Living Water by pouring out His Spirit? The spiritual drought in California—or anywhere else—is never a hopeless case for the God who rules over heaven and earth. There is no ground so hard He cannot soften it and no heart so lifeless He cannot revive it. What we saw in those two weeks in California is just a drop in the bucket compared to the overflow of grace the Spirit can send when God’s people seek His face. There are people in California and around the world who desperately need Jesus but don’t know it yet. It may appear dark over California, or wherever you live, but one day the Lord’s presence will draw near with a glory that outshines the California sun. Will you pray with us and these precious believers in California for an outpouring of the Spirit?